London, Rome, Vienna, Paris – all cities that feature regularly in the titles of significant musical works. But Reading? 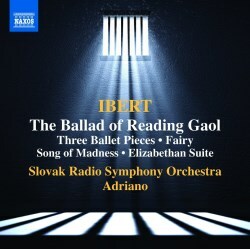 Apart from the famed ‘Reading Rota’ (best known as ’Sumer is icumen in’) I fear that, despite being a resident of the Royal County, I can’t think of an instance other than the work that features at the start of this disc – Ibert’s Ballad of Reading Gaol, a three-movement orchestral work inspired by the Oscar Wilde poem of that name. Surprisingly, it had never been performed in Britain – in Reading or anywhere else – until June this year, when it appeared in a programme by the Kensington Symphony Orchestra. I knew of its existence, but had assumed it to be a vocal or choral work. It turns out to be a rather fine three-movement piece from very early on in the composer’s career. Ibert, heir to the bitter-sweet irony of Les Six, is probably best known for his wonderful Divertissement, drawn from his music for ‘The Italian Straw Hat’ and Escales. But there are no comparable musical pranks here; it is a darkly impressive musical statement, entirely devoid of sentimentality or posturing (see also). It has in places the dramatic character that might suggest film music – Ibert composed a number of movie scores, including one for Orson Welles’ 1948 version of Macbeth – and the second movement has moments that sound intriguingly like John Williams’ ‘Harry Potter’ music (see also). So it’s not entirely surprising that the work was made into a ballet in 1937 - the Naxos booklet notes are rather confused about this. In his score, Ibert prefaces each movement with the relevant passage from Wilde’s disturbing and beautiful poetry, and those words are helpfully given complete in the booklet. Trois Pièces de Ballet (Les Rencontres) is, like all the first eight tracks on the disc, a work from the composer’s thirties. It was written first for piano, a series of short character pieces describing the various individuals who used to attend the parties organised by his mother, a sculptress with a strong interest in music. This is closer to the more familiar, lighter side of Ibert’s personality. Two fascinating short pieces follow, both from 1924. Féerique is a brief symphonic poem, and is, like the Pièces de Ballet, an orchestration of an earlier piano work. It brought to mind, for me, with its brilliant instrumentation and sharply contrasting moods, the Images or Nocturnes of Debussy. Chant de Folie (‘Song of Madness’) is quite extraordinary; a very short work for chorus and orchestra which sets a terse anti-war poem by Louis Pasteur Valléry-Radot. Ibert bravely captures the blundering madness of the marching troops, “….blood-bespattered…in rags, blindly staring”. After that, the Suite Élisabéthaine comes as a bit of a culture shock, with its good-humoured Neo-Classicism. But this is charming stuff - nine short movements written as incidental music for Shakespeare’s A Midsummer Night’s Dream. The Chanson des Fées (‘Song of the Fairies’), which sets ‘Ye spotted snakes’, famous from Mendelssohn’s music, is quite gorgeous, reminiscent of Poulenc’s vocal writing. Daniela Kubrická and the Slovak Radio Chorus capture the mood of this number perfectly, while the scherzo-like Dancerie which follows is appropriately Mendelssohnian in its gossamer-light woodwind writing. Altogether a delightful suite, which deserves to be much better known, possessing as it does some of the flavour we find in Stravinsky’s Pulcinella or Respighi’s The Birds. One little oddity is that the score has no cellos or double basses; perhaps they would have taken up too much room in the theatre’s pit. The recording was made back in 1993 and shows its age somewhat. The orchestral playing is acceptable, but the sound is rather too ‘close-up’ and lacking in perspective. Don’t let that put you off too much though; this music is emphatically worth hearing.